This room is for those who chose to side with Zagato and to prevent the Magic Knights from acheiving their goal. Please keep in mind that the people here are not evil. They all had reasons for siding with Zagato. The people here could be viewed as the helpers to the Magic Knights. After all, they did stregthen the knights' beliefs and gave the knights the determination and experience to win the mashins and defeat Zagato. There is no evil in Cephiro, no battle between the forces of good and bad, only two different groups of people lead by what they thought was right. The Sol of Cephiro is the Pillar's chief priest. He is the one who supported the Pillar in her prayers, who protected her so nothing got in the way of her prayer. Sol Zagato was not the stereotypical bad guy who's insane, trying to take over the world, etc. He was caring and considerate person who feel in love with the Pillar Esmeraude. Since then he would do anything to make her feel happy. He firmly believed that Esmeraude would be happy if she was not the pillar. When Esmeraude summoned the Magic Knights, he fought against them because he did not want Esmeraude to die. Zagato is not evil, he just wanted to protect Esmeraude and make her happy. Now doesn't that just make you all teary and bubbly inside?? Alcione was one of Zagato's minions. 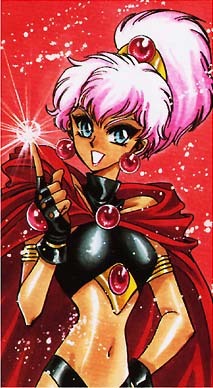 She was sent to eliminate Hikaru, Fuu, and Umi before they became the Magic Knights. Her first attempt was unsuccessful because the Hikaru had developed magic. Her second attempt was also a failure because Fuu and Umi had also learnt the usage of magic! Alcione was banished by Zagato after her second failure. Alcione fought for Zagato because she was in love with him. To prove her love, she was willing to do anything for him. Even if that meant destroying the Magic Knights who came to save Cephiro and holding the Pillar in hostage. Alcione is a sorceress. She was taught by the Guru Clef. Ascot is a Bal or a summoner. He was despised by others because of his friendship with the monsters that he summons. He was offered shelter and security by Zagato under the conditions that he would work for Zagato. Ascot agreed and that was how he became another Zagato's minions. We see Ascot when the girls arrive at the water shrine of Selece. He battled the girls by using his many monsters. Ascot was finally defeated by Umi. He was also given a stern lecture on what friendship meant and what self-esteem is. Ascot left the girls in search of a better a place to live. Caldina is a Ral can control other people and give them hallucinations with her dancing. She works for Zagato because he pays her. She only works as much as she was paid, no more no less. Caldina controlled Fuu's body to make her attack her fellow knights, but Fuu's will was greater than Caldina's so Fuu prevailed. Caldina was attacked by the magic she had meant for Hikaru and Umi. Since Caldina was only paid to hurt the Magic Knights, she went away as happy and chirpy as ever. Lafarga was Princess Esmeraude's bodyguard. He was brainwashed by Zagato to kill the Magic Knights. Lafarga was very loyal to Princess Esmeraude. 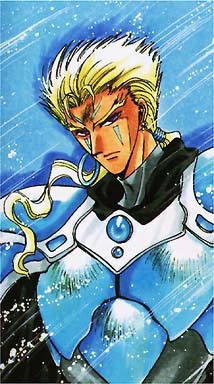 After his defeat by Hikaru, he kept asking about the Princess Esmeraude's well-being. Lafarga is a Dal or a swordsman. Lafarga almost killed Hikaru because Hikaru refused to use magic against a swordsman. And since Lafarga was a trained professional and Hikaru just an ametuer at kendo, you could see who was going to win. The one thing that prevented Lafarga from killing Hikaru is when he touched her sword. Hikaru's sword was made only for Hikaru and burnt anyone else who touched it. 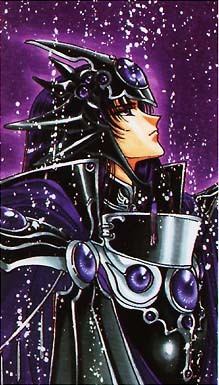 The burn made Lafarga regain his senses and stopped him from killing Hikaru. Back to the Gem Lake, the characters' files. Up to the main page. Copyright © 1999 by Lilianatha. This page is built on July 21, 1999.